Today, March 1, marks the grand opening of my online shop! Click here to shop all of my original art! I am super excited to be sharing about my journey as an artist here on the blog this week. How did I go from a 9-5 job with a beautiful shiny degree on the wall to now a professional photographer and gallery owner?! Let me tell you, it happened with me kicking and screaming. Struggle, tears, doubt, in the beginning what seemed like a daily basis. For starters, I've always been extremely talented with a pencil. I grew up watching my mother paint, my father work on projects like mosaics, build beautiful kitchens, and both transform rooms in our house not to mention our entire backyard together to an oasis. In short, I come from a talented family who has always fostered the creative bones in me. It was when I went to high school, that my grandfather personally introduced me to my art teacher, Ms. Foell. I'll never forget her introduction to our class that day, "you pronounce my name like you fell down- that's how you say it". And it was from that moment that a beautiful teacher-student relationship was born. She was everything a teacher should be and at a young age really fostered the artist in me. I am forever grateful for what she taught me. Post high-school, I went on to pursue a degree in Pre-med, landed myself a D in biochemistry, so I settled on a degree in Molecular Biology and Biotechnology. I took watercolor classes, piano classes, and all the physics classes I could. My best friend and I at that time, also an artist, painted all the time. I got really into painting with acrylics and painting really large pieces. I was tight on money in college like we all are so I started painting on anything I could- tables, chairs, large pieces of palm trees- you name it, I painted on it then hung it up. So the story goes, I graduated from undergrad and went on to teach Physics in Peace Corps Ghana (West Africa) and did secondary projects in community health in the community where I lived. I returned, moved to the Florida Keys to work at a marine institute where I met the love of my life, moved to the Mojave Desert to work a seasonal job as a wildlife biologist to make some extra cash, then went on to pursue my Masters in Public Health. 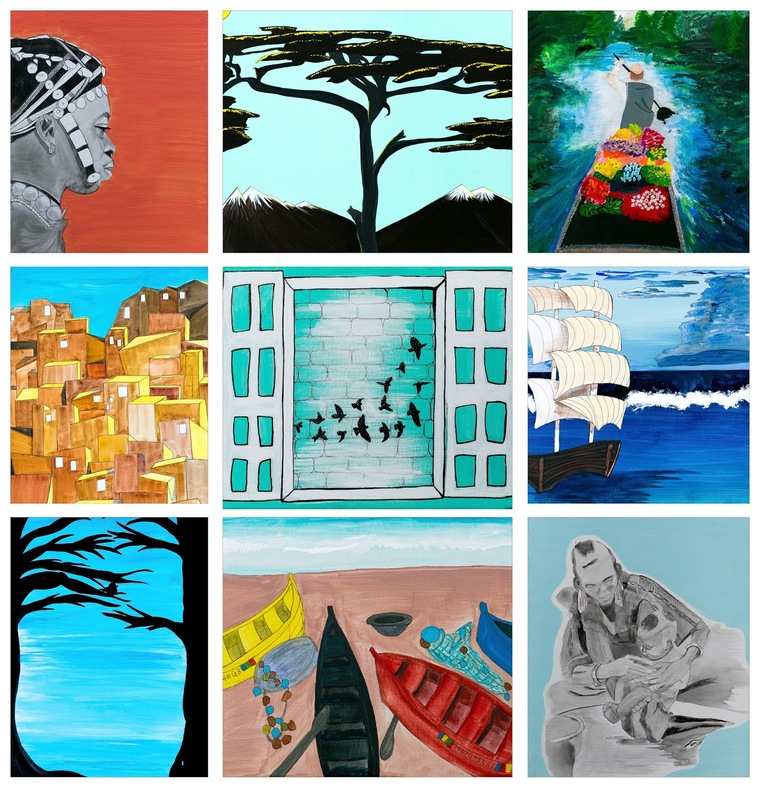 Throughout this time I painted a series called Africa Reflections which was a big part of how I processed my experience in the Peace Corps. My degree then promptly took me back to West Africa for research, to live in the Dominican Republic and pursue my thesis, had us moving to Vero Beach for a full time job, and even took me to live and work in Malawi for a few months too! I packed my sketch book every place I traveled. I never thought about art as a career or a full-time anything, but used it as an escape from how challenging and demanding working in public health could be. It was not until we moved to Australia, that I really dove into painting again. and big pieces- my favorite! 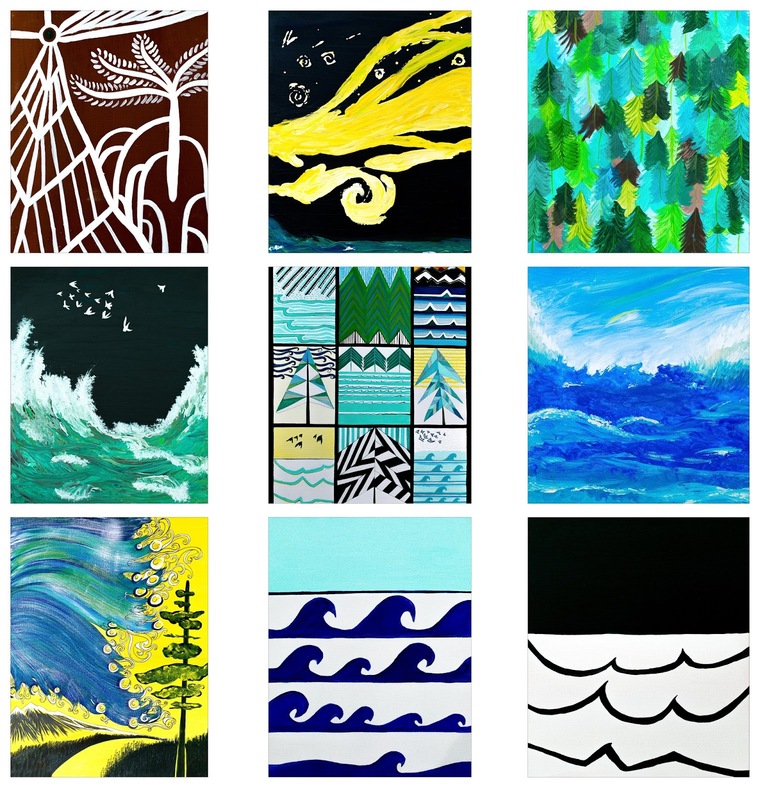 It was while we were living abroad as a newly married couple (one of my dreams) that I painted a series called Fresh Air inspired from my travels to Hawaii, Tasmania, New Zealand, and Fiji! I went on to dedicate the entire series to my best friend's first born Maya exactly the night she was born. So that's the short part of the journey actually. The long part is when I moved from Australia back to the midwest, the hard parts began. I jumped literally headfirst back into painting. I painted in our tiny 2-bedroom apartment, constantly pushing doubt out of my head. I realized I was fighting my own self doubt. As cliche as it sounds, I truly was my own worst enemy. There came a turning point where I started to paint what I loved and how I loved it, the colors, the motion, the fluidity of the nature I saw and felt around me. I stopped painting in color for a little while simply because I missed the bright colors of my home in Florida. I stopped painting for several months after that and then it came to me (as I know many of you artists can attest to), it came rushing in like a freight train. Exactly what I wanted to paint and how. and I had to paint it NOW. This painting above entitled: "The Blue and Green and Salt of my Heart" was exactly what I painted. I painted it during that first winter I moved to Wisconsin (my first winter ever- 2013). I painted it out of a very painful place I was in, in my life. I was struggling to adapt to winter, struggling living in a brand new place that I was ill-equipped wardrobe-wise for, and away from my beloved friends and family in Florida. Art was how I began to express myself to myself, when nothing else seemed to work. Upon finishing it, I hung this piece promptly on the wall in our living room. I drank my coffee in front of it every day. I went back and forth on whether or not I should put color on it. It grew to have so much more meaning as the days went on. I saw myself in it. If you look at the piece, the pineapple and palms each represent for me the taste and quintessential color of the tropics, my home. In the center of the heart, each smaller bump represents a different ocean or body of water that I've visited in the last 4 years that holds significance for me. The left side of the heart holds several red mangroves and represents The Florida Keys, where I met the love of my life. The long lines of waves on the very bottom of the heart represents how tumultuous and intense my journey migrating from Florida to Australia to Wisconsin was for me. It was important for me to paint this personal piece very large because I needed it to be a statement to myself. It remains one of my favorite pieces to date. In the end, I (obviously) decided not to put any color in it, but went on to paint an entire series called Migration that signified my own migration to a new part of the country, to my new life here in the Midwest. 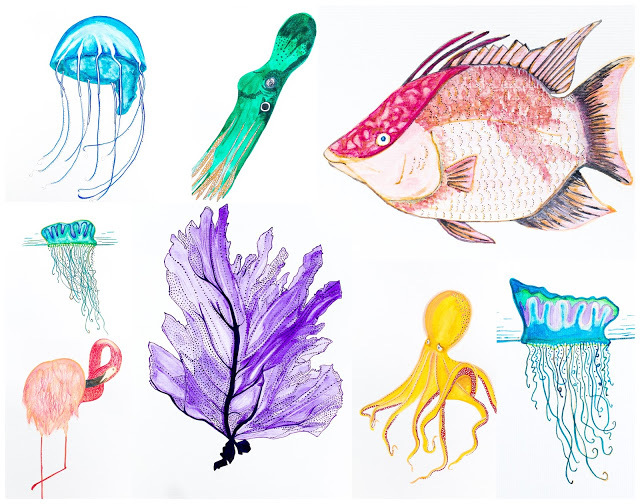 This watercolor series summed up exactly how I felt my first year living here: a fish out of water. I absolutely LOVED this series. It was bright, fresh, and so freeing to paint! 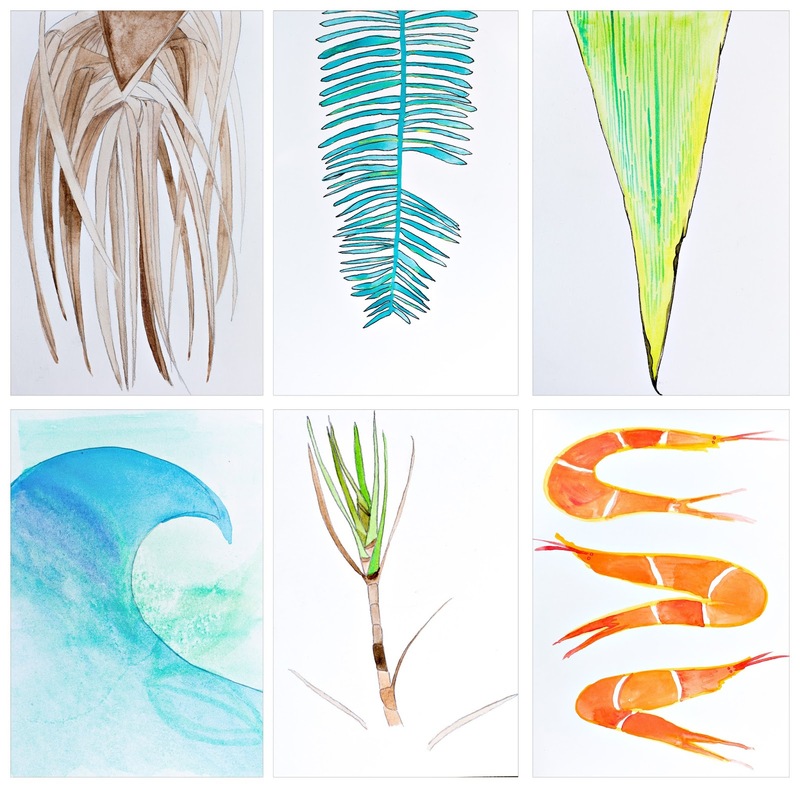 I continued to travel and out of my travels to The Florida Keys, Mexico, Colombia, Chile, and Brazil another series was born called Tropical Wanderings. 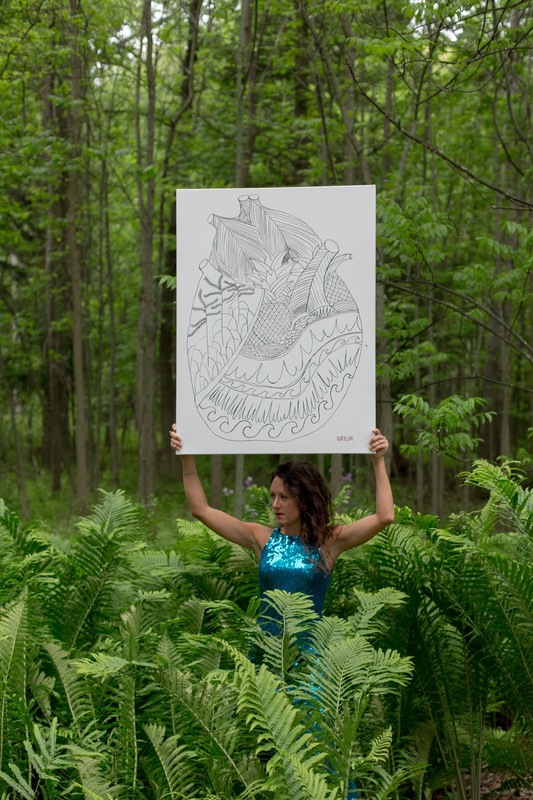 We finally moved out of our apartment and purchased a piece of property on the coast here in Door County and another series was born called Into the Deep. 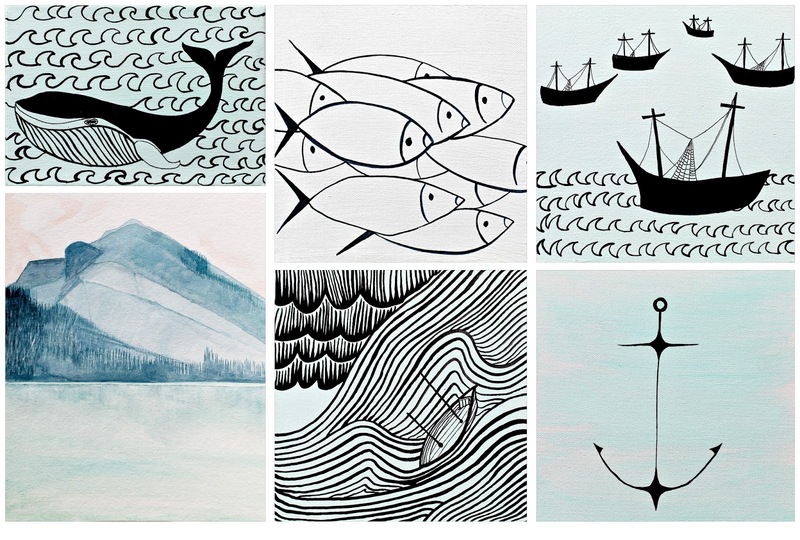 This nautical series was born from a peaceful place in my heart. I began to feel like I could call this beautiful place home. I felt settled. As I am writing this now, I never realized how much I had to say. If you made it to the end of this, thank you for reading about my journey. Take a peek at my shop- and consider supporting a living artist!